Need to give your cards an extra kick? Add flowers into the mix! It’s already February, so the air is filled with the scent of flowers. With Valentine’s Day just right around the corner, everybody’s thinking floral thoughts. StatisticBrain.com reckons that almost 200 million roses are produced on average for Valentine’s Day. With the holiday raking in around $14 billion worth of consumer spending annually, it’s no surprise that big-name companies have made it one of their biggest targets. UK-based retail chain Marks and Spencer have even extended their floral line to include wedding flowers in addition to their annual M&S Valentine’s Day offerings. Of course, all those flowers are not going to last forever, so what do you do with the ones that have gone from festive and healthy to dried and wilted? You could throw them away, but a better alternative is to turn them into an excellent addition to your paper craft kit, especially if you want to make your own greeting cards. By themselves, pressed flowers are excellent choices for decorating greeting cards. Just make your greeting card base and look for a flower that complements your design. Of course, keep an eye on the color and shape of the pressed flower so as to not make the final product look haphazard. 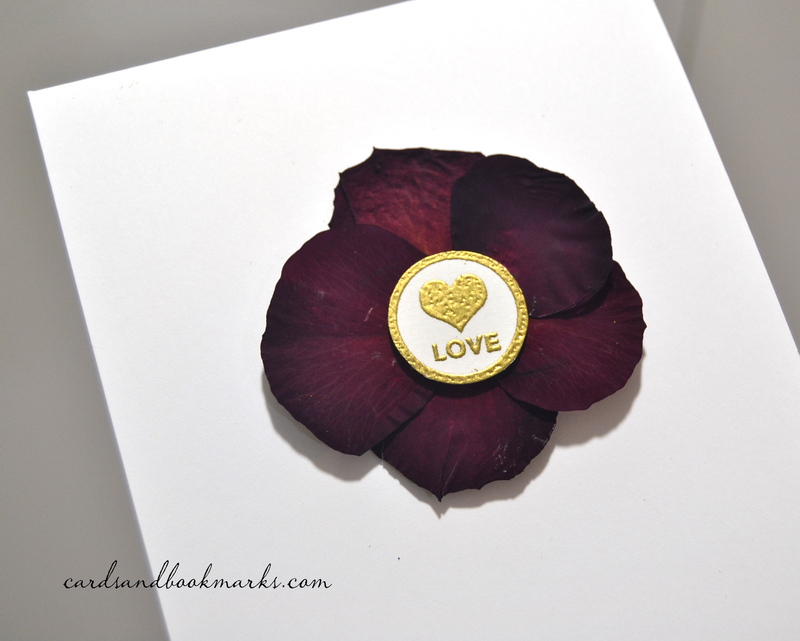 Here is an example of a simple flower recreated using pressed Rose petals. The center is a gold embossed stamp by Hero Arts/Studio Calico. What’s even more interesting is that you can actually make the entire card flower-based by making your own handmade paper out of petals. HobbyFarms.com has an excellent in-depth tutorial on how to do just that. Flower petals and other plant material may also be used to add a splash of natural color to your handmade paper projects. You can even branch out from greeting cards and use the handmade paper for other paper craft projects such as boxes, bowls, and frames. You can even go meta and use the handmade paper made out of flowers to make paper flowers! Post-Valentine’s Day, hold off a bit before chucking dried flowers into the trash. Instead, use them to add a new, natural dimension to your paper craft projects.